Mozenda is a powerful data extraction software that caters to the needs of multiple user types, specifically the end users, analysts, IT, and decision makers. With Mozenda, you have a simple and straightforward platform that lets you collect data from various sources, such as news reports, user reviews, price listings, sports statistics, historical archives, and product catalogs among others, and then convert all this data into very valuable business intelligence. 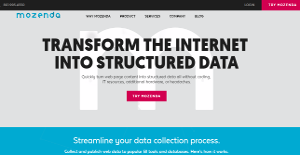 Mozenda streamlines the collection and aggregation of data and delivers it to you in the format that you need. The process is automated, saving you significant time and effort needed to make sense of tons of cluttered and unorganized data. Whether you are a small business owner trying to understand and take advantage of prevailing trends or a CEO who needs to have a detailed report on their business performance for the past 10 years, Mozenda takes care of it all and more. Information is key, whether old or updated, historical or real-time. With Mozenda, you have a solution that does all the hard work for you, scraping various sources to extract and deliver data right to your fingertips in the format that you want. Regardless of the type, the quantity, and the complexity of your online data sources, Mozenda can get that information you need in minutes, not hours. Almost all websites implement a listing approach to organize and structure their content. Mozenda automatically identifies these lists and creates agents that gather the information you specify across various pages. Complex paging structures and nested categories are challenging to work with. Mozenda breezes through them though and takes care of all the hard work. You do not need to create profiles of individuals and excruciatingly find relevant and related data so you can attach them to your profiles. Mozenda is designed to automatically identify names and associated values and create rich data sets and profiles without you having to intervene. The software detects name-value pairings across categories and pages and finds relevant information and captures them automatically. Data from tables can be complicated but Mozenda’s technology allows it to scrape all the significant information from table structures rather easily. For most data extraction tools, retrieving data from tables is nearly impossible. What usually takes days is mere minutes with Mozenda. If you are interested in Mozenda it might also be a good idea to examine other subcategories of Best Business Intelligence Software collected in our base of SaaS software reviews. Enterprises have diverse needs and requirements and no software solution can be perfect in such a situation. It is pointless to try to find an ideal off-the-shelf software product that meets all your business requirements. The intelligent thing to do would be to modify the solution for your specific requirements, worker skill levels, finances, and other elements. For these reasons, do not hasten and pay for well-publicized leading solutions. Though these may be widely used, they may not be the perfect fit for your particular wants. Do your homework, look into each short-listed platform in detail, read a few Mozenda reviews, speak to the vendor for clarifications, and finally settle for the app that presents what you require. How Much Does Mozenda Cost? We realize that when you make a decision to buy Business Intelligence Software it’s important not only to see how experts evaluate it in their reviews, but also to find out if the real people and companies that buy it are actually satisfied with the product. That’s why we’ve created our behavior-based Customer Satisfaction Algorithm™ that gathers customer reviews, comments and Mozenda reviews across a wide range of social media sites. The data is then presented in an easy to digest form showing how many people had positive and negative experience with Mozenda. With that information at hand you should be equipped to make an informed buying decision that you won’t regret. What are Mozenda pricing details? What integrations are available for Mozenda? If you need more information about Mozenda or you simply have a question let us know what you need and we’ll forward your request directly to the vendor.